Can you believe Christmas is in 8 days?! The last couple of weeks have flown by, and now we are packing up and getting ready to head to Florida in a couple days to be with my family for Christmas. We just have today and tomorrow of work before our holiday break officially kicks off - plus tomorrow is my birthday! To celebrate and kick off our two week much needed vacay, Thomas and I have a room booked at McMenamin’s Edgefield tomorrow night. It’s like it’s own little town! Cozy quaint rooms at the hotel, a spa with outdoor soaking pools, a wine room and brewery on-site, and a delicious restaurant! I’m beyond excited for a little r&r and a night away before we fly home! I’m sure most of you will be having guests in your home and hosting family and friends in the coming weeks. It’s the best time of year getting to spend time with everyone you love the most, but sometimes entertaining can be tiring! 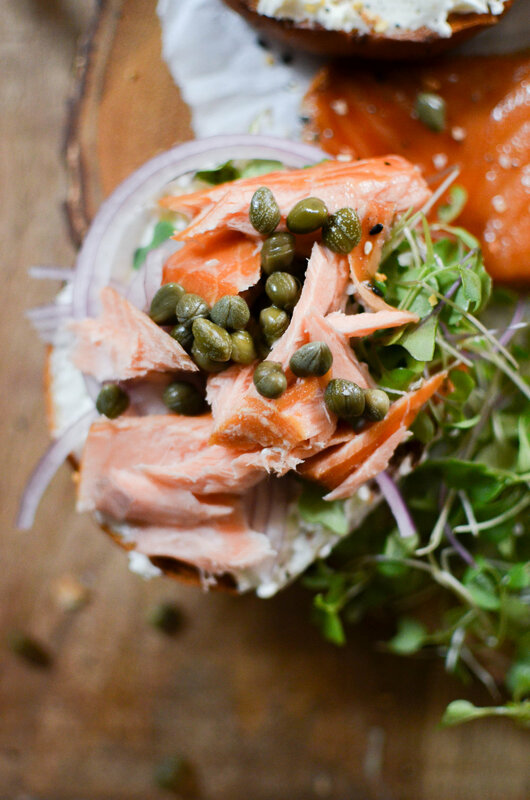 Instead of stressing over an elaborate breakfast in the mornings, something that is so easy (and fun to eat) is smoked salmon bagels! So simple and who doesn’t love a good toasty bagel?! 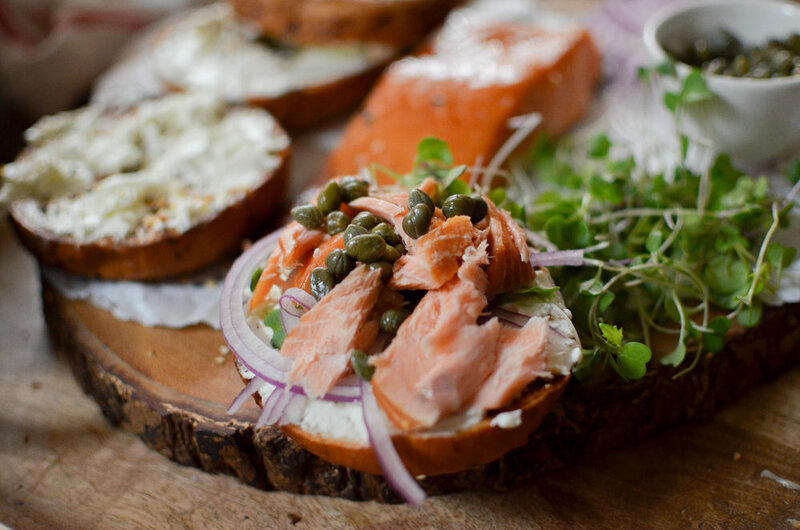 Make it a DIY situation but laying out the salmon, bagels, cream cheese, and all the toppings out on a serving tray so everyone can build their own the way they like! I love the Hot Smoked Scottish Salmon from Trader Joe’s, but any lox or smoked salmon will do. - All the toppings: capers, thinly sliced red onion, capers, micro greens, cucumbers, and sliced tomatoes. toast the bagels right before serving - place cream cheese in a dish with a spreader, place toppings around the tray and let everyone build their own bagel. Easy peasy!